W2-0006: Pyramid of the Sun from Western ApproachThe Pyramid of the Sun, or Pirámide del Sol, is the largest pyramid at Teotihuacan and was by far the largest building in the New World when it was completed in the 2nd century. It is thought to have taken over 100 years to construct and contains over 1.1million cubic-metres of adobe mud bricks at its core. Its scruffy exterior is the result protruding brickwork designed to support over 60,000 square-metres of stucco – which was once painted and decorated with murals. At its base, the Pyramid of the Sun measures 223.5m and its peak reaches 71.2 metres tall (you can see just about see people stood at the top in fig. W2-0006). Some deviations from its original form were caused by the aggressive archaeology carried out by Leopoldo Batres in the early 20th century – this most noticeably a resulted in a fifth layer being added close to the peak. W1-0019: The Scruffy Faced Pyramid of the SunThe Pyramid of the Sun’s size is such, that it immediately draws parallels to the Great Pyramid of Khufu in Egypt. In fact, almost unbelievably, the base of the Pyramid of the Sun is virtually identical in size to that of the Great Pyramid of Giza (which measures 230m). And it isn’t just the size of the Pyramid of the Sun that strikes accord, for it also sits amidst a trio pyramids that appear identically aligned to those of the Giza Plateaux. 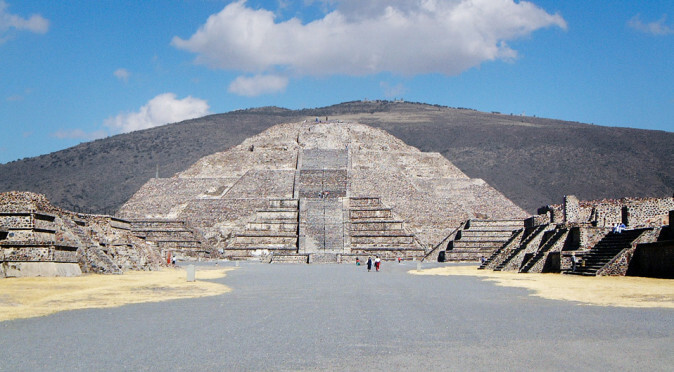 At Teotihuacan, these pyramids are known as the Pyramid of the Moon (furthest north), the Pyramid of the Sun (central) and the Pyramid of Quetzalcoatl. Furthermore, the alignment at both sites clearly reflects the alignment of the three stars of Orion’s Belt (see fig. W1-0011). This has brought about some notable theories on ancient trans-oceanic contact and the plausible existence of an ancient super-race who spread knowledge of geometry and astrology across the globe. These super-humans are thought to be recorded in pre-historic artwork using animal forms to describe their origins and their wisdom. This, it is argued, explains the many strange and often similar anthropomorphic gods that are found throughout the Americas, Egypt, Mesopotamia, India and the Far East. W1-0011: The alignment of Teotihuacan, Orion & Giza The likenesses between the Pyramids of Teotihuacan and those of Giza are undeniable, but they are not identical. 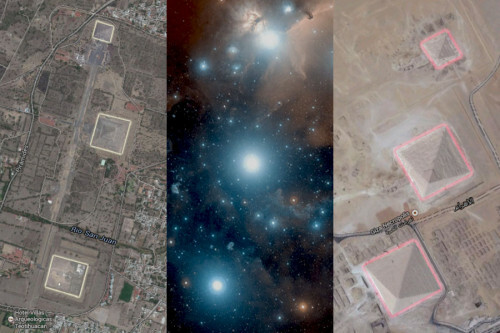 The Pyramid of Quetzalcoatl is not the large square that it is visible on satellite images (as outlined in fig. W1-0011). This large square is a plaza known as the Ciudadela, and whilst the Pyramid of Quetzalcoatl is located within the Ciudadela, it measures a diminutive 60m across its base. However, the Ciudadela measures 233m across the front, equalling that of the Great Pyramid, and the Pyramid of the Sun originally measured 215m, which is identical to the Pyramid of Khafre. Of course, these identical results aren’t necessarily the result of contact, and it is far more plausible that both sites were using the same symbolic calculations. To provide an example, if you divide the radius of the earth (6,371km) by the length of a lunar cycle (29.53 days) then you get 215.74km. 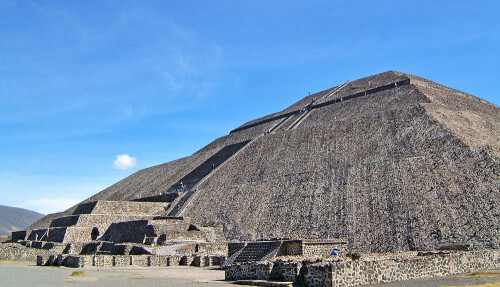 Using similar techniques, researchers have decoded a number of links between the structures at Teotihuacan, celestial objects, geometry and time (there are many books on this subject). W1-0010: Aerial View, demonstrating the odd alignment of the Adosado platform it is possible that the Adosada Platform at the front of the Pyramid was designed to point at the solstitial event, because it is considerably skewed at an angle of around 21º north of east. These sacred alignments and measurements are found not just within the Pyramid of the Sun, but also within its relationship with other structures. For example, during the 3rd century the Pyramid of the Moon measured 87.15m, which was approximately 40% the size of the Pyramid of the Sun. Between the 29th April and the 11th August there are 105 days, which is 40% of 260. 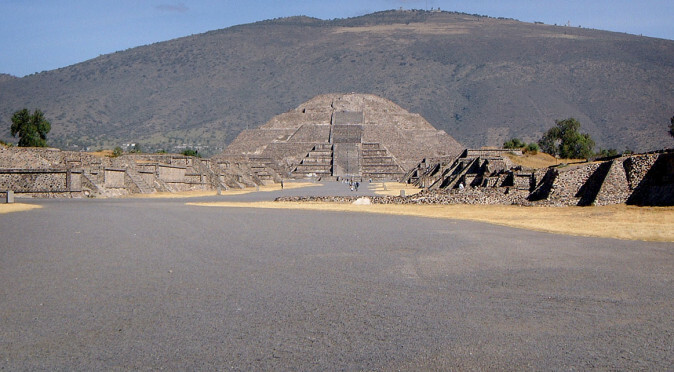 So the Pyramid of the Sun represented the ritual calendar of 260 days and the sun’s slow death towards the winter solstice and its resurrection back to Teotihuacan, whilst the Pyramid of the Moon represented the sun’s transit north, to the summer solstice. Because the relationship was made through the pyramids’ dimensions (i.e. 87.5m = 105d and 215.8 = 260d), we are also able to calculate a standard length by day, which is 83cm (215.8 ÷ 260). This, it is believed, is the standard unit length used by the Teotihuacano people to build there monuments and was based on the length between the heart and the fingertips of the average Teotihuacano man. 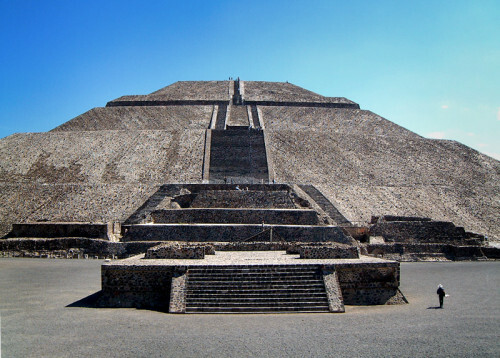 With this measurement in mind, the Pyramid of the Suns original height of 60m would have equalled 72 Teotihuacano standard units, which may relate to the precession of the equinoxes, whereby the earth’s axis moves by one degree every 72 years. The 260 day ritual calendar was used throughout Mesoamerica, but where the concept came from and why it was 260 days is not known. It wasn’t simply a ritual calendar, but an ingenious cog that locked together with the 365 day solar calendar to produce a 52 year cycle. before realigning itself back at day one. This system meant that lengthy celestial cycles could be tracked and simply expressed – which was vital for the Teotihuacano as they had no known form of writing. The Maya, who did have writing, created an enormous third cog to produce the “Long Count” that offered a cycle of 5125 solar years. W0968T : Stela C W0962T: Stela A This immense cycle of time was known as a “Sun”, and two stelae at the Mayan city of Quirigua record the Fourth Sun as beginning on the 11th August 3114BC when a God called Itzamna placed three hearth-stones to create a home for humanity (click here to read the full article). These three stones are associated with the stars of Orion and the date, the 11th August, is one of the two dates that the Pyramid of the Sun faces the sunset to create the 260-day period. 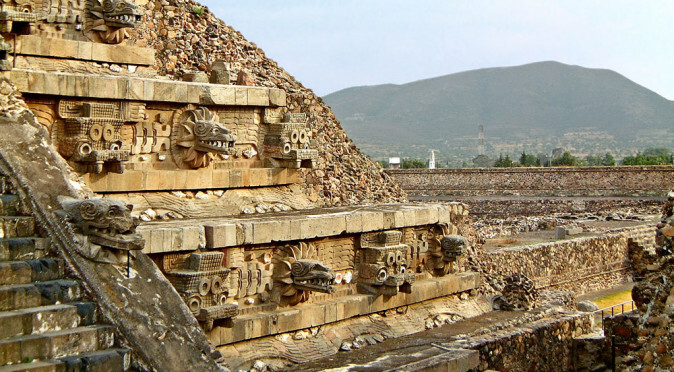 This presents the possibility that Teotihuacan was perceived to be the place where Itzamna placed the three-stones of creation and that the three pyramids are symbolic of these three stones. This would also explain why the pyramids are aligned with Orion and also, why the Pyramid of the Sun locked in on to the 11th August 3114BC. Curiously, the First Dynasty of Egypt also began in around 3114BC, with the legendary King Menes combining the crowns of Upper and Lower Egypt. In the same way that the measurements of the pyramids equal one another, it is also possible that an global or celestial event of enormous significance occurred on this date, which was subsequently locked into the creation myths of both civilisations – and represented by Orion. Quirigua is situated over 1100 km from Teotihuacan, on the very opposite side of Mesoamerica. However, records at nearby Copan suggest that the first ruler of Quirigua was despatched from Teotihuacan in 425AD, along with the first ruler of Copan. 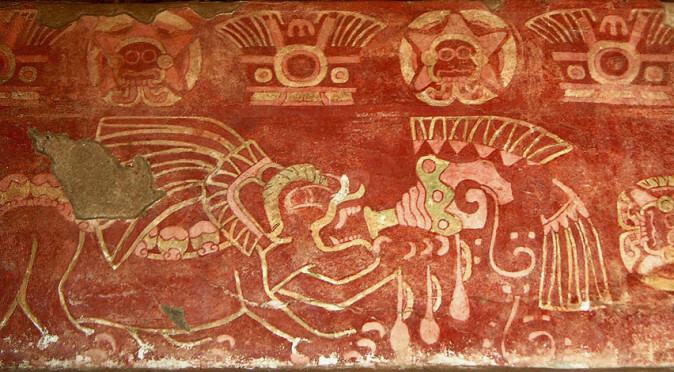 It is therefore possible that Teotihuacan’s own creation myths were passed on to Quirigua and then down through the generations where they became blurred with the Maya’s own myths. W4-0013: Disc of DeathCloser to home, the Aztec’s, who settled just 50 miles from Teotihuacan more than 600 years after the city was abandoned, also believed that Teotihuacan was at the centre of the story of creation. 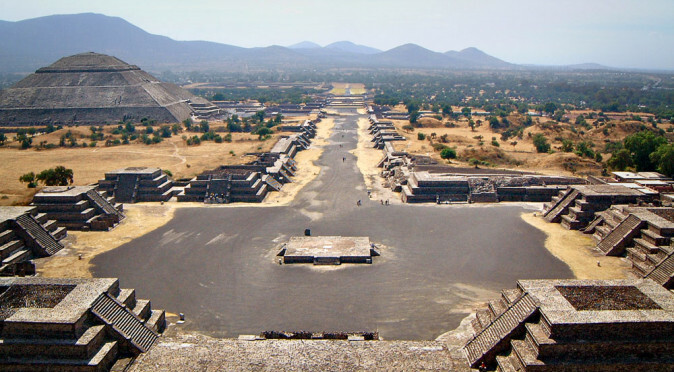 They named the abandoned city Teotihuacan, which means “Birthplace of the Gods”. The Aztecs believed there had been five Suns and that the Gods had to sacrifice themselves in various ways in order to create each one. 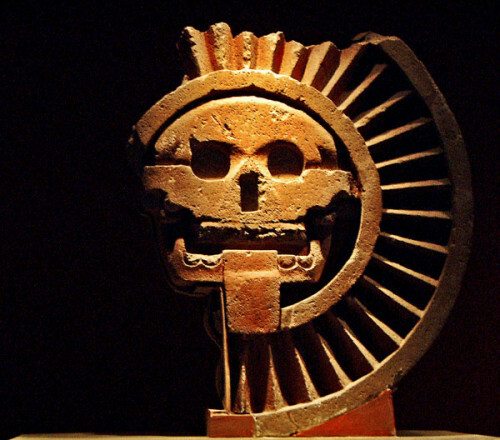 The gruesome “Disc of Death” that was found in the Plaza of the Sun certainly alludes to these legends, with the skull symbolising the death of the god who sacrificed himself, the radiant beams circling around his head to symbolise the sun, and the tongue flopped out to indicate he needed to be offered blood sacrifices (fig. W4-0013). But before anything could be created, space had to exist. 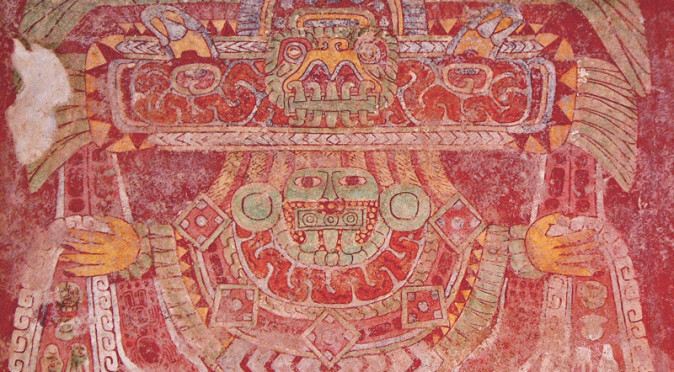 This happened when a god called Ometeotl created itself and then gave birth to four gods, known as the four Tezcatlipoca (Aztec) or Bacabs (Maya), who represented the spacial elements (east, west, north, south) and the primary colours (red, white, black and blue – green, the most sacred colour, represented life and fertility). Buried at the heart of the Pyramid of the Sun is an ancient cave that features four chambers, which fan equally around to create the appearance of a flower. A tunnel leads from in front of the Pyramid of the Sun for 130m and undulates in a serpentine manner to create the appearance of an umbilical cord or vaginal passage. The result is a symbolic womb of the earth buried directly beneath the Pyramid of the Sun that may have been believed to be the place where the four Gods were born. 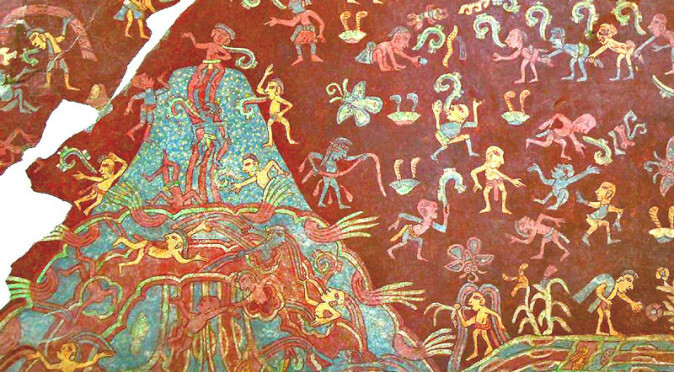 Caves were perceived as earthly wombs throughout Mesoamerica and this is echoed in the Nahua legend of Chicomoztoc. This legend that states the various Nahuatl speaking cultures of Central Mexico and the Highlands are all descended from a legendary cave (called Chicomoztoc). HTC-1: Diagram from the Historia Tolteca-Chichimeca Research into this legend has been being going on for centuries, and a 16th century Nahuatl codex entitled the Historia Tolteca-Chichimeca, features a diagram of the Seven Caves, buried beneath a mountain, amongst cactus-ridden highland plains. This diagram of Chicomoztoc presents an exact likeness to the flowering cave network found beneath the Pyramid of the Sun, but with seven caves instead of four. This flowering image (as you can see in fig HTC-1) presents an uncanny likeness to a womb, complete with vaginal passage and external genitalia. 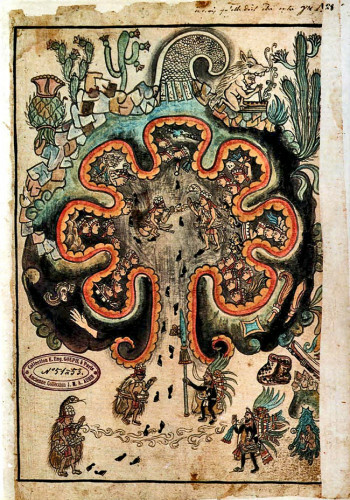 With the tradition of Chicomoztoc passing via oral tradition for over 1000 years, with many cultures (including the Aztec) wanting to be associated with the cave in order to validate their legitimacy to rule, it would not surprising if the number of caves had been expanded from 4 to 7 to incorporate additional tribes. However, there are a further three caves buried beneath the Pyramid of Quetzalcoatl that makes the cave count seven. If these caves were used by elite families as spiritual birthing centres to associate their own children with divinity, then there is a very high probability that seven Lord’s were born in the caves of Teotihuacan and did create Seven Tribes as they expanded Teotihuacan’s territory. We know that Lord’s were despatched from Teotihuacan to Tikal, Copan and Quirigua in the 4th and 5th centuries and that their lineages were still highly revered in the 9th and 10th centuries when these cities collapsed – so it is highly likely the same happened in Central Mexico. Certainly the caves played a crucial part in symbolism of the Pyramid of the Sun, and the link to birthing rituals or the birth of the Gods may be evidenced in the four burials that were found beneath its foundation – three of which featured adults holding children. The caves also appear to be the reason for the pyramid being built on this spot, for archaeologists also found the remains of three older structures and a plaza wall buried beneath the Pyramid of the Sun’s foundations. INAH-TEO-1: Jade Mask © INAH This demonstrates that it was a sacred location long before the pyramid was built and was possibly indicates the presence of a culture that pre-dates the Teotihuacano. Evidence of an older culture may have been uncovered in the form of a ceremonial jade mask that was also found buried beneath the Pyramid of the Sun (fig. INAH-TEO-1). Measuring 11cm tall and carved in exquisite 3-dimensional form, the mask strikes familiarity with the works of the Olmec and the Maya. 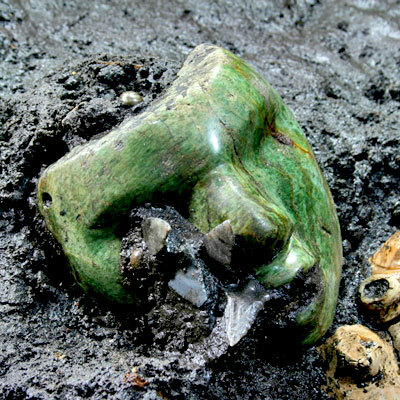 The Olmec had mysteriously disappeared by 400BC, but are renowned for utilizing jade in this way. The Maya were beginning to come to prominence when the Olmec disappeared, leading many to speculate that the Olmec were assimilated into the Mayan culture. Jade could only be found in the Motagua Valley, close to the modern border between Guatemala and Honduras – deep in Mayan territory. So the mask is almost certainly indicative of early trade, or the presence Olmecs or Mayans, prior to the Pyramid of the Sun being erected and Teotihuacan being founded. 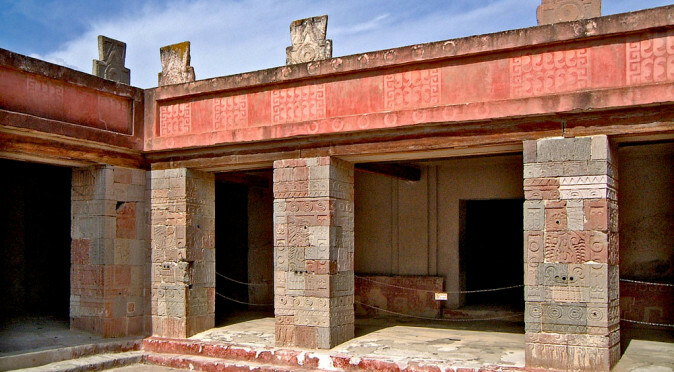 This connection would eventually go full-circle, with Teotihuacan being instrumental in the founding of Quirgua and Copan to industrialise the extraction and trade of the jade from the Motagua Valley. W2-0012: View from Pyramid of the MoonThe last piece of this vast monument’s symbolism is perhaps seen as you look due south from the Pyramid of the Moon, for in the distance a huge mountain outlines the Pyramid of the Sun, as though it was deliberately built to reflect the sacred landscape and create a true south axis in conjunction the Pyramid of the Moon (see fig. W2-0012). 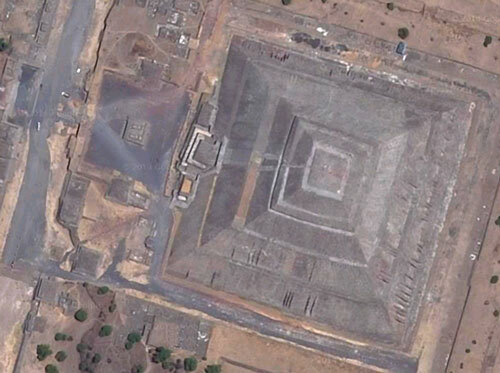 This final piece of coded symbolism cements the Pyramid of the Sun as one of the most impressive and esoteric monuments to world history ever constructed. It also raises huge questions of who could have built such a monument. 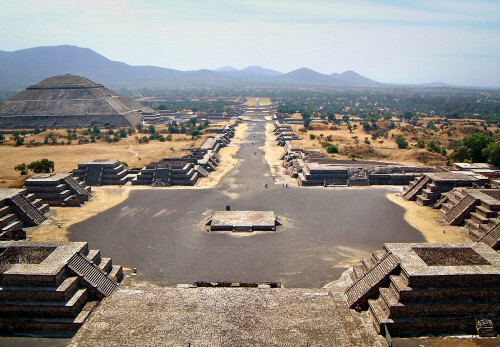 According to archaeologists, the Pyramid of the Sun was the first monumental building to be erected at Teotihuacan and the rest of the city was organised around it. Without any steady development, either within in the city or its surrounding environment, it really does seem as though the gods landed at Teotihuacan with a predetermined plan to build a monumental city dedicated to the fundamental principles of the universe. Perhaps this isn’t far from the truth, for the evidence of an Olmec or Mayan presence, combined with a belief that this was the spot that time began, could hint that the Mayan’s, influenced by Olmec beliefs, despatched a Great Lord to find the spot where time began. Armed with centuries of Olmec knowledge, this Great Lord may have been tasked with constructing the Pyramid of the Sun and other monuments to record the origins of time, and then build an entire city to reflect the heavens – essentially creating a City of the Gods. What a wonderful article (or rather, series of articles), perfectly well explained, well crafted. Wonderful to learn more about my own heritage. Thank you for your feedback. It is always nice to know that people are reading and enjoying the site, and your kind words are greatly appreciated. So amazing buildings, paintings and mysterkies! Thanks so much for this valuable piece of culture! Thank you for your feedback. I am very pleased you enjoyed the article. It truly is an amazing place built by a remarkable and mysterious culture. It boggles the mind just to stand on the Avenue of the Dead and it has to rank as one of the most important historical sites in the world! Not how, but WHY many of the ancient monuments were built: There are spirals of less gravity on the surface of the earth. The two I am most sure of are at Giza and in Florida. The Egyptian one passes through the peaks of the three main pyramids, and it is why the area rose up to become a plateau. The Florida one starts at Corkscrew Marsh; as it grows in size it goes through the area of Coral Castle and then roughly over the keys, which it drew up to be islands. Further, after it leaves the East Coast of America it goes through the Bermuda Triangle and then comes to land again in Belize. There are one or more step pyramids that were built in its path and I think the monuments near to Mexico City have this arc of less gravity than the norm as well. See, the once and future osiris.blogspot.com. Please pass this on to someone that can investigate. Joe R.